CashNetUSA Reviews - Legit or Scam? CashNetUSA Reviews – Legit or Scam? CashNetUSA is a payday lending company that also specializes in installment loans, Credit Services Organization, Line of Credit, Credit Access Business loans, and loan matching services. As a national payday loan company, CashNetUSA takes into account the laws of each individual state their clients may live in. Because of this, they don’t offer all services in every state. You must look at their state guide to see what services are offered in your home state. 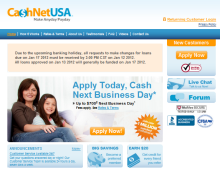 In order to be eligible for a payday loan or payday advance from CashNetUSA.com, you must be a citizen or permanent resident at least 18 years of age, with an active checking account, who has been employed for at least one month. Payday loans, or payday advances, are short term loans given to people who can verify they have a regular income and a checking account. Credit scores and equity will not be taken into account. These loans must be paid back very quickly, generally on your next scheduled payday, and carry very high interest rates and loan disbursement fees. Many times payday loans can be so high they make it difficult for borrowers to reasonably pay back the money according to the loan terms. This has made payday lending and payday lenders the subject of much criticism and scrutiny. CashNetUSA claims to strictly follow all the laws and regulations put into place by the state in which you live. For some people, this is important because certain states have made laws which significantly benefit those looking to borrow payday loans, often limiting the interest rates and fees that can be charged. But other states have very relaxed laws regarding these loans, and therefore it is up to the borrower to make sure they understand all the borrowing terms and fees before they accept any loan. For those who do choose to use CashNetUSA for payday lending or short term installment loans, they do have a Preferred Member Savings program that all clients are immediately enrolled into. In the future, if you need to use CashNetUSA for another loan, you can use your membership number to be eligible for savings on your loan fees. Average Rating for " CashNetUSA " is 3.4 out of 5 based on 5 reviews. I hate to be the one to tell you and other borrowers what I am about to write here but…We have been doing business with CashnetUSA since 2007. I’ve carried more than 10 loans with these guys and I’ve never had a problem…they don’t harass us…we receive a robo-reminder call 2 days before the ACH draft happens. “It is what it is,” however; not many organizations in the world make, practically, blind and unsecured loans to individuals…that is why a 200% interest charge is assessed(or double what you borrow. Other lenders like ACE charge an APR of 1000% default swap). So, you know that this Chicago-based lender is either part of the Mob or just plain lone sharking. You have to begin paying them back IMMEDIATELY…in installment payments. I would not recommend taking a $600 dollar installment loan if you are someone who is going to turn around, blow it all in a day and not have even the first payment available. Did they ask you for your bank username and password to vetify your bank information? CashNetUSA debited an unauthorized amount of $80.00 from my checking account on July 18, 2016. I called CashNetUSA to update my pay day scheduled prior to this unauthorized debit. On July 19, 2016 my husband who is a "Disabled Veteran" and I also spoke with a "Supervisor" named "Trenton B." (He would not give us his last name), did not apologize for this but reluctantly refunded the $80.00 back to our "Joint Checking Account". "Trenton B." told me and my husband that going forward these unauthorized debits would not happen again. Also that I needed to call CashNetUSA to remind them not to debit any monies for the balance owed until my next scheduled pay period which was July 25, 2016 and August 11, 2016 with the final debit for the remaining balance on September 3, 2016 due to the "Labor Day" holiday which falls on September 5, 2016. On July 25, 2016, CashNetUSA debited $80.00. I called CashNetUSA on July 30, 2016 and July 31, 2016 to remind them that my next scheduled pay day was August 11, 2016. I was told that they had my updated pay day and they would debit $80.00 on August 11, 2016 which they did. My balance was $102.08 after the debit. But my account showed that my next debit due date was August 15, 2016 instead of August 22, 2016. On August 15, 2016 CashNetUSA debited my account in the amount $90.00 which caused our checking account to be "Overdrawn" by the amount of ($92.41). I called CashNetUSA on August 15, 2016 to advise them of the "Unauthorized" debit of $90.00. The "Customer Reps" told me they had no record of me sending them my updated pay scheduled. I ask to speak to a "Supervisor" and she also told me that there was no record of my updated pay period that I sent to them via email on Julu19, 2016. But I have a return email from "Trenton B." the first "Supervisor" that I spoke with on July 19, 2016 acknowledging he had received my updated pay dates. The "Supervisor" said that it was nothing they can do about the "Unauthorized" debit because per CashNetUSA it was scheduled for August 15, 2016 instead of August 22, 2016. My current is $12.08. But we have been caused great financial harm and our checking account could be closed because of this "Unauthorized" debit. I want all "Consumers" in the United States that have seen the commercials on TV or the internet regarding the ease of borrowing money from CashNetUSA, DO NOT BORROW MONEY FROM THIS COMPANY! They use fraudulent business practices to us the "Consumers" that reside in United States. I believe because we are near the end of paying this deceptive, deceitful business called "CashNetUSA" they want to drag this out by using the above described unsavory business practices to keep in an endless web of "Emotional Distress" and "Financial Hardship". We have found the hard way. Do Not Use this company or any other "Pay Day Loan" company to borrow money from. This may happen to you. My daughter took out a payday loan through Cashnetusa. I have been mercilessly harassed by debt collectors trying to collect from her. I gave told them repeatedly that that she cannot be reached at my phone number or my address. Illegal collection practices including threats of arrest and prosecution for bank fraud and check fraud, harassing and abusive phone calls, even the accusation that I could be prosecuted for for obstructing a criminal investigation for not providing callers with my daughter's cell phone number. I have digital recordings and written documentation to prove what they have done. I have reported these calls to every Texas State and Federal agency possible. They are all jokes. Cashnetusa obviously pays pretty good money to regulators who are supposed to protect the public. They were a true blessing when I truly was in need. I would go back if I ever needed help again. Did they ask you for your bank username and password ? ?